Give a gift your mother will never forget on a very special day. Mother’s Day! A hot air balloon ride from Arizona Hot Air Balloons! Hot air balloon flights over Arizona are world renowned offering photographers a panoramic platform to capture the stunning beauty of our great state. Fly near the beautiful lake Pleasant and scenic Sonora Desert preserve. On most balloon flights you’ll see mule deer, hundreds of birds and other wildlife as we skim the treetops. It’s a birds-eye view you can ONLY experience in a hot air balloon. Arizona Hot Air Balloon rides has flown thousands of passengers on breath-taking hot air balloon rides in Arizona since 1975. What an amazing gift. If you can not make the Mother’s Day balloon ride, you can order her a Mother’s Day Gift Certificate. Now you will have a tangible item you can give to mom over the family dinner. A Mother’s-Day-Hot-Air-Balloon-Ride-In-Arizona is an amazing gift to give your mother. Our mothers are one of the hardest workers we know. In fact, Milton Berle was quoted “If evolution really works, how come mothers only have two hands?” His quote could not be anymore close to the truth. Mom’s oversee everything in our lives, in fact their jobs are never done even as we leave the home and start our lives. College, marriage, job promotions, child birth, and all our large and small milestones….. Mom is there. There are so many gift ideas we can choose from on this special day. Why not give her the memory of a lifetime. Give her a mother’s day hot air balloon ride. She will slowly float off of the face of the earth, for about an hour hot air balloon ride over the beautiful Sonoran Desert. The Sonoran desert is the youngest and the in the world with an average of 6″ of annual rain fall. Many of the drought tolerant plants lay dormant a lot like a hibernating bear in the Alaskan winter. The plants lay there waiting for the perfect time and when the water comes, these plants come to life. The views are amazing with the yellow, reds, and orange poppy flowers lace the green mountain ranges will only awe the hardest working mother. Arizona Hot Air Balloon company believe that every mom is special. We will give you our oath that when your mother is with us, she will be treated like family, from first handshake till our last hug goodbye! 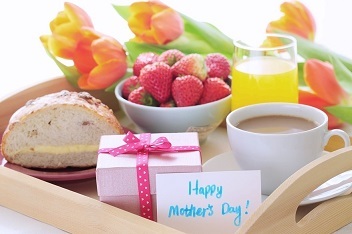 Mom’s deserve the best and we understand that. Send her on a Mother’s Day hot air balloon with with Arizona Hot Air Balloons and she will not be disappointed. Balloon rides make memorable gifts and are bucket list items for many. It’s a great group gift from a family or from everybody in the office for the boss. Gift certificates for birthdays, anniversaries, Mothers Day, Fathers Day, Weddings balloon rides and other special events are available. Hot air balloon flights are scheduled year round, due to our lush constant weather. Visit our Flight inquiry page or call 480-282-8686 for more information. Visa, MasterCard, Discover, American Express, money orders, or cashier checks are accepted.